The U. S. Episcopal Church has, since its formation, produced a translation of its liturgy, the Book of Common Prayer, into French. The first two editions (1789 and 1892) apparently were primarily for use in French-speaking (Francophone) congregations within the United States, but, by the time of the 1928 edition these congregations appear to have been very few in number. 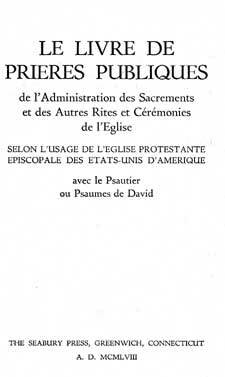 At least two separate French editions of the 1928 BCP were issued: one for general use within or outside the U. S., and the other specifically for use in the Episcopal Church in Haiti, which was then, as it is now, part of the U. S. Episcopal Church. Both of these editions are very similar, with differences primarily only in some of the Prayers, and in occasional phrases or words translated differently. The French text appears to be nearly identical to the English 1928 edition, with everything in the English edition included in the French. There are a few minor differences, additions and omissions. Any significant differences between the English and French editions are indicated in the text. The primary text used here is the edition for general use (published by Seabury Press in 1958), called here the "generic" version. As noted above, an edition was published earlier in 1940 specifically for use in Haiti. Differences between the two versions other than words or phrases translated differently are given in the text. The Haitian version omits everything before Morning Prayer (Table of Contents, Preface, Tables, etc. ), omits the Catechism and Articles of Religion, and additionally includes a "Supplement" of short services, devotions, and prayers. These books are listed in David Griffiths' Bibliography of the Book of Common Prayer as 36:76 (generic version) and 36:75 (Haitian version). In addition to the HTML files below, we also have both the complete Haitian version and the complete "generic" version as PDF files, with extractable text. Note that the text has not been proofread and undoubtedly contains errors. Note also that the occaisional "corrections" present in the Haitian text are not official and are from a previoous owner. My knowledge of the history of these French editions of the BCP, and of French-speaking congregations in the Episcopal Church is quite lacking; if any have additional information I'd be pleased to hear it. Title page for the "generic" French edition. Title page for the Haitian edition. The Order for the Administration of the Lords Supper or Holy Communion. The Collects Epistles, and Gospels, to be used throughout the Year. Je certifie que la présente édition du Livre de Prières Publiques contient une traduction fidèle du texte officiel du Book of Common Prayer, à l'exception du Psalter qui est tiré de la traduction de la Sainte Bible par Louis Segond.